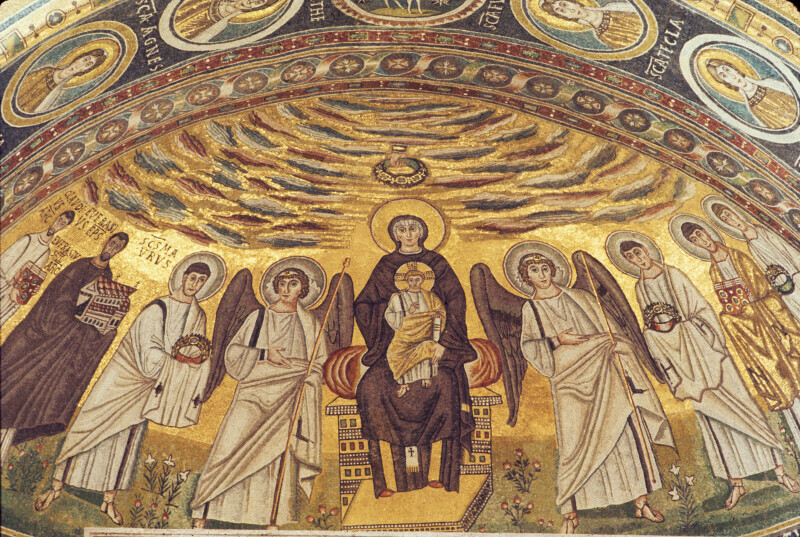 In the apse mosaic, the Virgin and Child are enthroned in the center against a gold backround with layers of clouds. A hand from heaven lowers a jewelled wreath-crown towards the Virgin. To the viewer’s right, an angel presents three unnamed male saints. To the viewer’s left, an angel presents St. Maurus, Bishop Eufrasius (the patron of the building), Archdeacon Claudius, and the archdeacon’s son, Eufrasius. St. Maurus, an early bishop of Parentium (Poreč), was the patron saint of the church: an inscription of the fourth or fifth century naming the saint was found near the episcopal throne in the axis of the apse in the nineteenth-century excavations. His body, however, was stolen by the Genoese in 1354 when they sacked and burned the town (Terry and Maguire , pp. 6-7). Cited sources: Terry, Ann and Henry Maguire. Dynamic Splendor: The Wall Mosaics in the Cathedral of Eufrasius at Poreč. Univ. Park, Pa: Pennsylvania State UP, 2007. D'Emilio photo archive no. 19773718_1280u.